Marrakech is a desert paradise unlike any other, full of history, mystery and romance. Worlds away from your average holiday, the Red City will introduce your senses to new wonders around every pisé corner. We’d happily wander these streets for days on end, but then we’d miss out on all the incredible sights and experiences that surround the city as well. From mountain ranges and deserts to waterfalls and ancient villages, there are day trips from Marrakech that will light a spark in the heart of any traveller. You might happily wake up at dawn and return to your villa long after dinner, or you might prefer adventures less than an hour from your doorstep. Either way, Marrakech is your ideal home base. In this blog, we’ve gathered our top recommendations for the best day-trips from the city, each awaiting eager explorers like yourself. You don’t see much, or any, of the sea in Marrakech. But a mere three hours away in the town of Essaouira, you can enjoy the sound of waves hitting sandy shores and breathe in the salty, fresh air of the Atlantic. Located right on the water, Essaouira is not your traditional beach-destination. Most days, the winds blow much too hard for anyone to relax on the warm sands. Known as ‘The Windy City of Africa’, the town instead attracts crowds of windsurfers to its beautiful shores. Rather than lounging on the beach, you’ll want to visit Essaouira for the city’s fascinating culture and unique character. Much more laid back than the bustling Marrakech, Essaouira is undeniably Moroccan – yet there is nowhere else quite like it in the country. The city is famous for its fortified inner white-and-blue medina, where palm-lined streets with colourful boutiques, fascinating museums and art galleries abound. This old town is small and easy enough to navigate on foot. All roads in the medina lead to its main square by the waterfront, where views of the gorgeous harbour and miles-worth of sandy beaches paint a spectacular image. 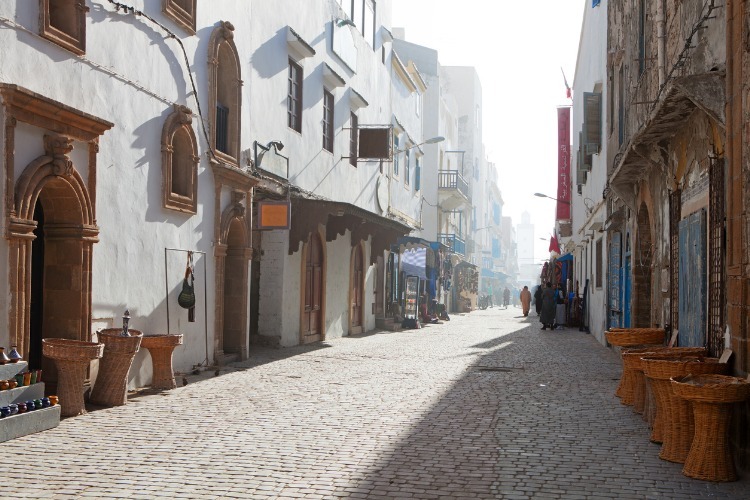 We can certainly see why the city was named Essaouira, which means ‘Little Picture’ in Arabic. Along the ramparts that enclose the city, you can still spot the old canons that are left over from when the city was a Portuguese military fortress. Walking on these walls is also the best way to soak up the spectacular views of the city and ocean beyond. The Ourika Valley tends to be a much welcome escape from the scorching desert heat of Marrakech. Just an hour drive south of the city, it’s one of the most convenient day-trips from the city. This verdant valley stretches for 68 glorious kilometres in the shade of the snow-capped High Atlas range and is dotted with streams, waterfalls and pretty Berber villages. It is named after the river Ourika, which descends from the mountains above, providing the valley with its lush wildflower flora. Most tourists travel to the village Setti Fatma, located deep in the valley at the end of the main road. This village is set on the green riverside terraces of the High Atlas foothills and is famous for the series of seven waterfalls that adorn the hillside above it. The waterfalls at Setti Fatma are all reachable by foot with varying degrees of effort, and the further up in the hills you get, the more breathtaking the waterfalls and the views become. To reach the last one can be quite a hike, but come prepared with proper footwear and plenty of water, because you won’t want to miss out on it. Aside from Setti Fatma, there are plenty of other places in the Ourika Valley to explore as well. One of our favourites is the little pottery village of Tafza which is home to a fascinating museum of artefacts and information all about Berber culture. And for another taste of history, visit the ruins, tombs and mausoleums in the archaeological site of Aghmat, once one of Moroccos oldest cities dating back to pre-Islamic times when it served as the country’s capital. Agriculture in the valley is also vibrant and picturesque, and you can pass through everything from olive groves to cherry orchards on your explorations of the area. The Atlas Mountains quite literally draw the line between the Sahara Desert and the coast of Morocco. There are three ranges in total and the most popular with visitors from Marrakech is the High Atlas, a mere 90 minutes away. 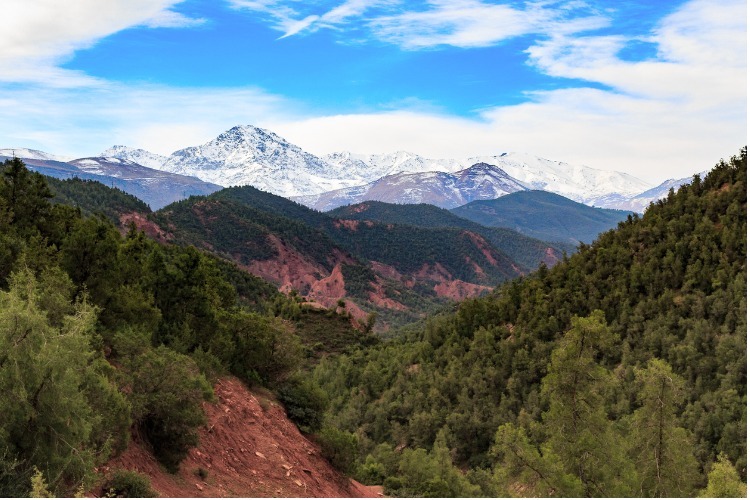 These mountains are home to spectacular hiking trails that will take you past some of Moroccos most dramatic landscapes and scenery, as well as the gorgeous Toubkal National Park. In the valleys and foothills of the mountains, you’re bound come across some ancient Berber villages with farms and herds of livestock. 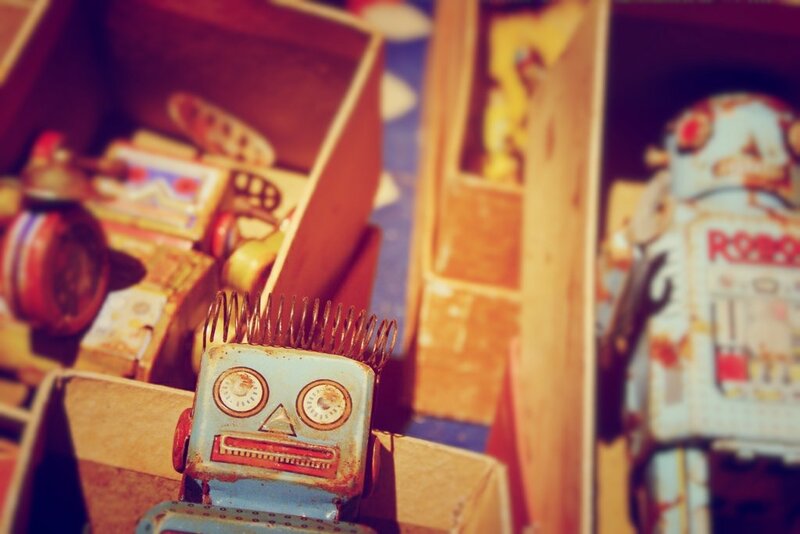 Life here goes on much as it has for the past thousand years, creating a minimal ecological footprint. Stop by one of these villages to learn more about their fascinating culture before heading on through the tranquil mountains. Not far from the High Altas range is its sister, the Middle Atlas. 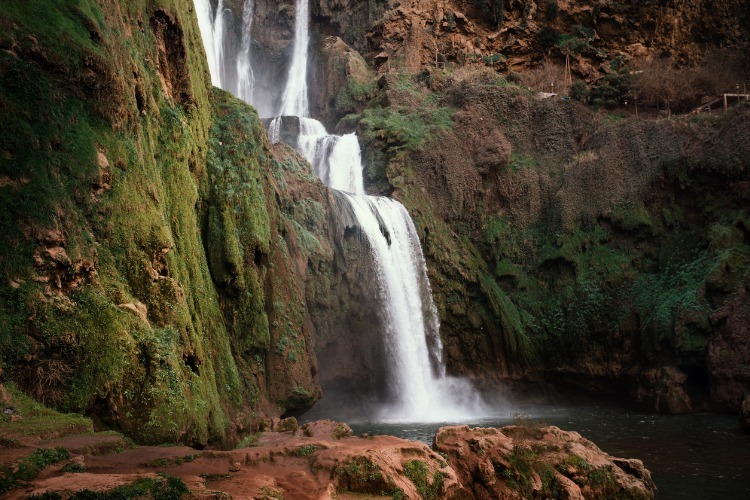 This is where you’ll find the world famous Ouzoud Waterfalls (or Cascades d’Ouzoud) which are known to be the most gorgeous waterfalls in Morocco. They cascade in levels from cataracts at the top into a pool in the valley 100 metres below. Make sure to visit the falls on a sunny afternoon to see rainbows that appear in the mists. Boatmen will take visitors out into the main pool to view this natural wonder up close – close enough the feel the cool mists on your face. Surrounding the falls there are walking trails that will allow you to explore more of the verdant surroundings, and you won’t believe you’re only 90 minutes from the sandy desert climate of Marrakech. With all this talk of ancient villages and traditional culture, it’s easy to forget that Morocco is a modern, thriving nation. Casablanca will quickly remind you of that. This stunning city is cosmopolitan, fast-paced and full of prospering, young, creative industry. Your first impression of the town is bound to be the blend of architectural styles. Its rich history has allowed for Moorish, French-colonial and traditional Moroccan buildings to stand side by side in the vibrant downtown. Yet, huge modern developments are constantly underway, and the city is ever growing and changing. 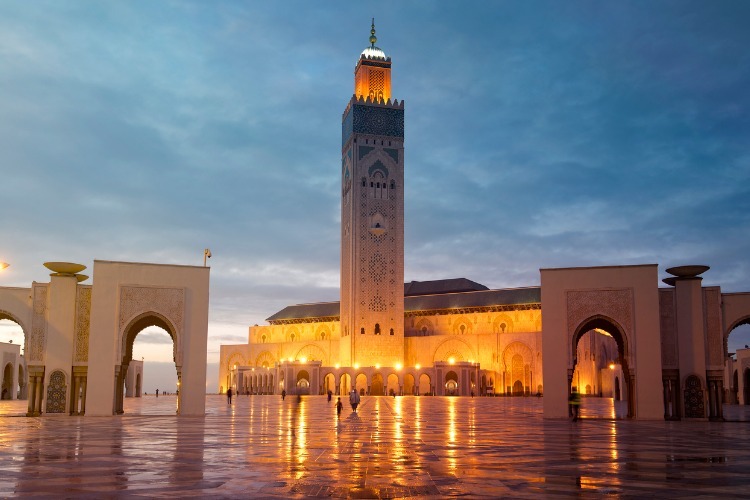 But don’t forget to appreciate the parts of Casablanca that have truly stood the test of time, such as Hassan II Mosque, which is the oldest mosque in the country and the combined effort of a thousand talented artisans. For a more modern type of art, visit one (or five) of the many art galleries that occupy the city’s old art-deco villas. Casablanca is a hub of culture and art where you can find everything from paintings and sculpture to dance and music. Speaking of culture, don’t forget about Casablanca’s culinary scene – our top recommendation is heading down to one of the many waterfront restaurants on La Corniche for dinner with a sea-view. This coastline is the heart of Moroccan surf-culture, and there are some excellent schools if you fancy joining the locals in giving it a go. Since Casablanca is not a tourist city, it’s not full of tourist traps. You can relax walking the French-style streets knowing that you’re getting the same authentic experience as anyone who lives there. This goes for everything from cafés and restaurants to the boutiques and galleries. Ait-Ben-Haddou is a UNESCO World Heritage Site right on the edge of the Sahara Desert, where this city of ruins stands surrounded by olive groves and palm trees. 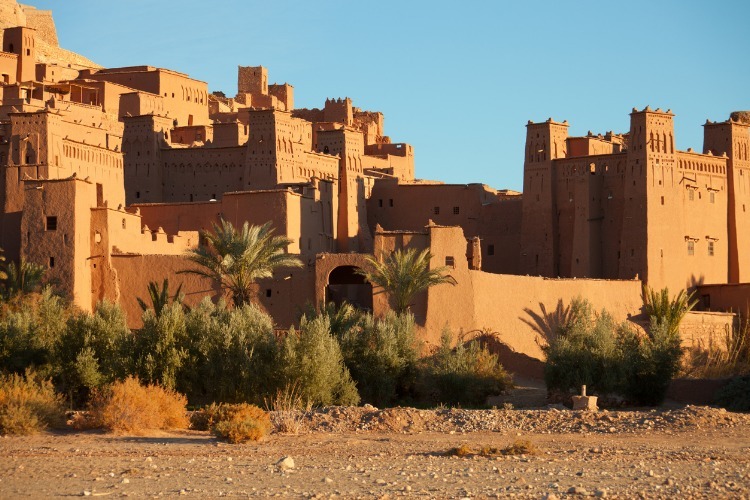 The journey here is 3 and a half hours long from Marrakech, deep into the mountains of Ouarzazate via winding roads. Perhaps unsurprisingly, its rugged remains were used to portray the slaving city of Yunkai in the Game of Thrones television series, but that’s not why most people come to see it. In the 17th Century, Ait-Ben-Haddou was one of the region’s most prominent fortified villages and a major trading stop en route from Marrakech through the Sahara. It was built to last, on a hillside, with thick outer walls that were easy to defend, and fortress at the top. But the city eventually failed to withstand the dwindling of that once popular trade route, which took the city’s primary source of income when it disappeared. Since then, rough weather has taken its toll on the clay architecture leaving the town in near-ruins. By the 1940s some ninety families remained. Today, there are only five. The old streets are narrow and full of steep staircases, and the once strong walls are now crumbling, but the old city still holds an appeal for those who can walk those labyrinths and picture the lives that were once lived there. Above all, it is a fantastic example of traditional pisé architecture and 17th-century city planning, full of individually fortified citadels and castles. There are plans in place to authentically restore Ait-Ben-Haddou to its former charm and stature, and there is hope that the village might even be re-populated in years to come. No more than 40 kilometres south of Marrakech, along the Route d’Amizmiz, the Agafay Desert makes for an ideal day trip away from the city. It is infinitely more accessible than more famous the Sahara, and you can hop in a car or on a bus to arrive in no more than an hour. 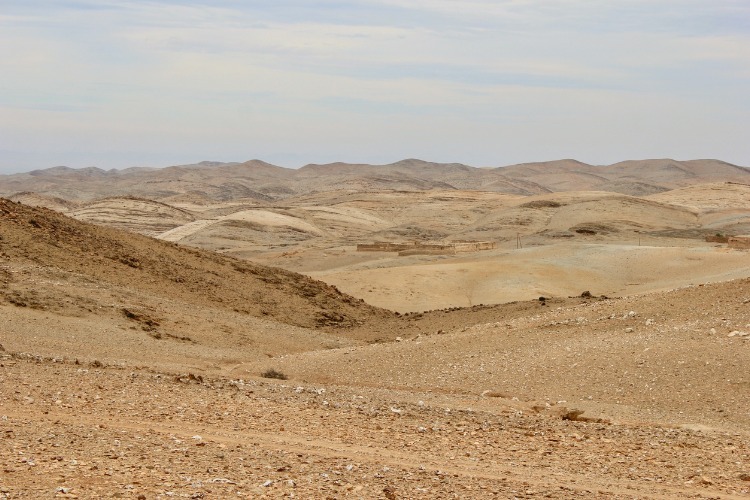 The Agafay is popular with locals and foreign visitors alike and is the ideal location for everything from horse riding and camel trekking to quad biking and plain old hiking. What attracts, of course, is moving amongst the seemingly endless hills and desert dunes that take over this part of the region during the dry summer season. Backed by the ever-present snow-capped High Atlas, the landscape is eerily reminiscent of a lunarscape. While the desert is too dry for any development, the area’s ‘wet season’, aka spring, sees a plethora of natural life spring from the parched ground. When the wildflowers to grow, the landscape changes entirely and holds remarkable beauty for a short while. If you’ve been itching for a bit of beach-time during your time in the dry Moroccan heat, visit the humanmade Lake Takerkoust, right at the edge of the desert, for some swimming and sunbathing along its shores. The lake has been carefully constructed to blend perfectly with the landscape and contributes to enhancing the natural beauty of the Agafay. Plus, if you forgot to bring a picnic, there are restaurants around the lake which provide a perfect for a mid-day break from exploring. Or if you prefer, there is also a sprinkling of Berber villages in the foothills of the mountains, where you can arrange to enjoy a homecooked meal. Skiing is probably one of the last things that come to mind when you’re thinking about holidays in Morocco (unless you’re especially clued into off-the-beaten-track snow sports destinations). 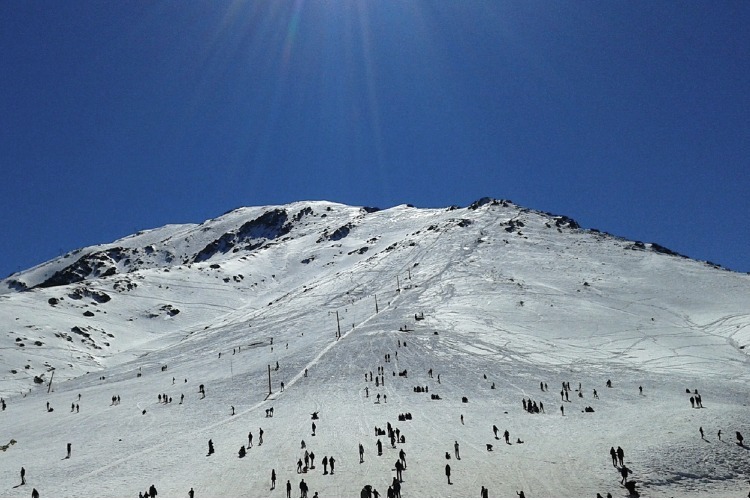 However, a short 45 minutes from Marrakech, and some 3000 metres up in the Atlas Mountains, is Africa’s highest ski resort – Oukaïmeden. With a handful of runs coming down from the peak of Jebel Attar, and around 20 all in all, you can easily spend a day enjoying the scenery of the Atlas Mountains from a whole new perspective. Now, no-one expects you to bring along ski-gear to a holiday in the desert. At Oukaïmeden you can rent skis and boots for a much lower price than you’ll ever come across at a European ski-resort, and lift-passes are even cheaper still (but if lifts aren’t your thing there’s always the option of riding a friendly donkey to the top). And if someone in your party is still a beginner on the slopes, you can get some lessons as well. Fair warning, the pistes at Oukaïmeden aren’t as well groomed as what you might be used to in the Nordics or European Alps, and it might take a bit of getting used to skiing on ‘virgin snow’. 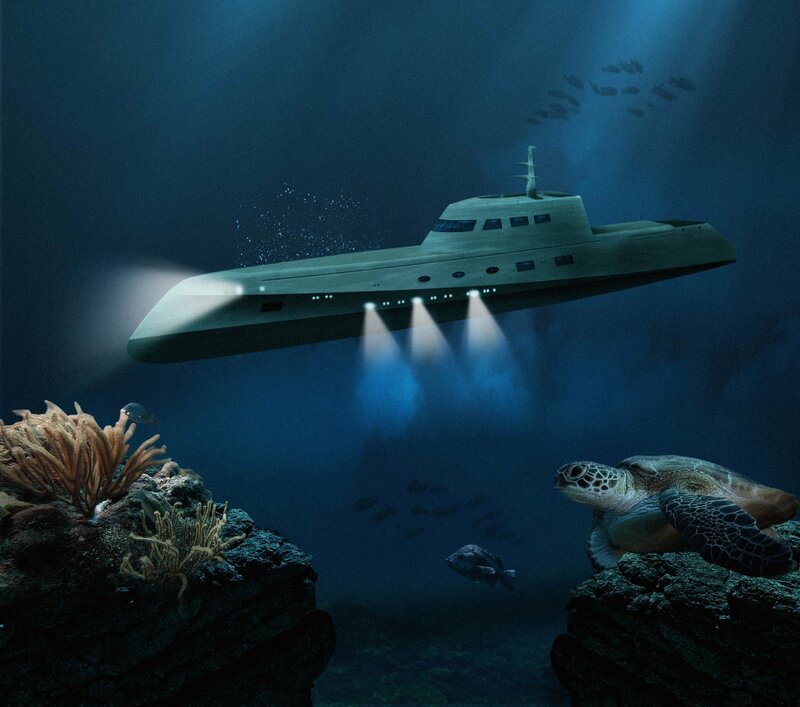 But before long it will feel like smooth sailing, and we promise it’s all good fun and completely safe. We recommend visiting in the winter months to get the best snow coverage. And when you’ve finished your snowy adventures for the day, there is even a selection of restaurant serving hearty meals to fill you up the before the journey home. We bet your mind is already half-way to Marrakech by now, so make the rest of your holiday planning easy on yourself! Get in touch with our friendly concierge team who can help you find the perfect luxury villa in Marrakech to accommodate you and your fellow travellers. Not quite ready to book yet? No problem – get inspired by browsing our online portfolio and see more of what our Moroccan villas have to offer.